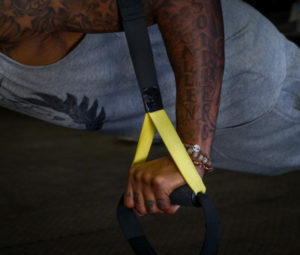 Hold TRX grip in each hand, facing away from anchor point. Assume push-up position with feet directly under anchor point and body at about a 45-degree angle. Flex elbows next to sides and slowly lower body until chest is even with hands. Forcefully contract chest and flex arms to drive body to start position.